Hello official renders of the LG Spectrum, the latest 4G LTE behemoth to make its way to Verizon. Well, it’s not there yet, but we most certainly know that it will be here before too long. We first reported it as having ditched the “Revolution 2” nickname back at the beginning of November, but the folks over at PocketNow have discovered some press shots of it with “Spectrum” attached to help confirm that. Specs are obviously unconfirmed, but we were told long ago that it would sport a 4.5″ HD display, dual-core processor, and be extremely thin. 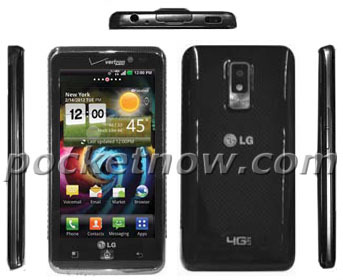 LG has already released an HD phone on AT&T as the Nitro HD – this looks to be a similar phone. Willing to give LG another shot?